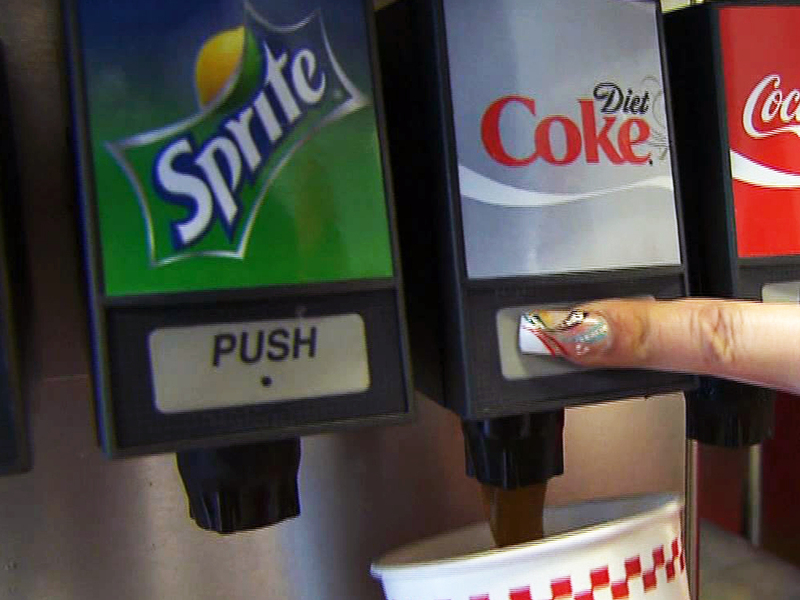 (CBS/AP) About half of New Yorkers say Mayor Michael Bloomberg's proposed ban of sugary drinks over 16 ounces from the city's eateries is an example of government going too far, while 42 percent say it would be good health policy, according to a poll released Monday. Bloomberg scoffs at critics on soft drink rules: "We're not taking anything away"
Of the 500 adults surveyed Sunday for the NY1-Marist poll, 53 percent said the proposal is a bad idea, while 42 percent praised the concept - which would make New York the first American city to so directly attempt to limit portion sizes in an attempt to fight obesity. Forty-five percent of those polled said they think the ban would help people lose weight, while 52 percent said it wouldn't make a difference. More than half the people surveyed said they never order a sugary drink large enough to be banned. The pollsters contacted people at random on cell phones and land lines on Sunday. The survey has a margin of error of plus or minus 4.5 percentage points. Last week, Bloomberg proposed limiting portion sizes of sugary drinks to 16 ounces at the city's restaurants, delis, food trucks, movie theaters and sporting arenas. Regular soda and sports drinks would be affected, while diet sodas wouldn't. Any drink that's more than half milk or more than 70 percent juice would be exempt. Refills will not be banned under the proposal. Grocery stores and many convenience stores are regulated by the state and wouldn't be impacted. "Every study shows that you will eat a very big proportion of whatever's put in front of you," Bloomberg said in an interview with CBS News. "And if you have to make a conscious effort to go to another cup, you're less likely to do it." According to CBS New York, drinking one soda a day equals 50 pounds of sugar a year. Americans consume 200 to 300 more calories a day than they did 30 years ago, CBS News reported. "When we're looking at a city where there is an epidemic of overweight and obesity and we look at the diseases that are associated with obesity, even in young kids, 50 pounds of sugar a year, of added sugar to rest of the diet, is way too much," Cathy Nonas, director of the city's physical activity and nutrition program, told CBS New York. Since New York City banned sugared beverages from schools in 2003, the city's health commissioner says there's been about a 5 percent reduction in the obesity rates in NYC public school kids in the last four years, according to CBS News. Marc La Vorgna, a spokesman for Bloomberg, said the poll showed New Yorkers weren't overwhelmingly set against the proposal. "We didn't propose it because we thought it would be popular, but it should come as no surprise that the numbers are so close since New Yorkers always have had an openness to bold ideas when taking on intractable problems," he said in a statement. The ban has been denounced by the soft-drink industry and critics who accuse the mayor of trying to institute a "nanny state" rather than allowing individuals to make their own choices. It's expected to win the approval of the Bloomberg-appointed Board of Health and take effect as early as March of 2013. Soda company Coca-Cola says New Yorkers are smart enough to make the choice for themselves. Fast food chain restaurant McDonald's whose drinks would be impacted by the plan also released a statement against the proposal, CBS Moneywatchreported. "Public health issues cannot be effectively addressed through a narrowly-focused and misguided ban," the company said. "This is a complex topic, and one that requires a more collaborative and comprehensive approach. McDonald's takes the well-being of our customers very seriously, and we continue to work, along with our supplier partners, to be part of the solution." Several obesity experts backed the proposal. Dr. Brian Elbel, assistant professor of population health and health policy at New York University told HealthPop last week that he saw the ban as really innovative and has a very large potential to have an impact at obesity and obesity rates." Dr. Kelley Brownell, director of the Rudd Center for Food Policy and Obesity at Yale University, told The New York Times that over time people will quickly become conditioned to the soda restrictions and will feel less cheated. "You'll set a new norm," Brownell said. "Just like everybody in the country used to smoke, and there's a new norm now."